While each agave spirit has its own name and most have a Denomination of Origin, mezcal is still the general term used by many producers and consumers throughout Mexico for any agave spirit. But for technical purposes, I have outlined what is produced in each Mexican state. -Tequila can be produced in only 5 states; Jalisco, Guanajuato, Michoacan, Nayarit, and Tamaulipas. About 99% of all tequilas come from Jalisco and only the Tequliaña Weber Azul agave can be used. 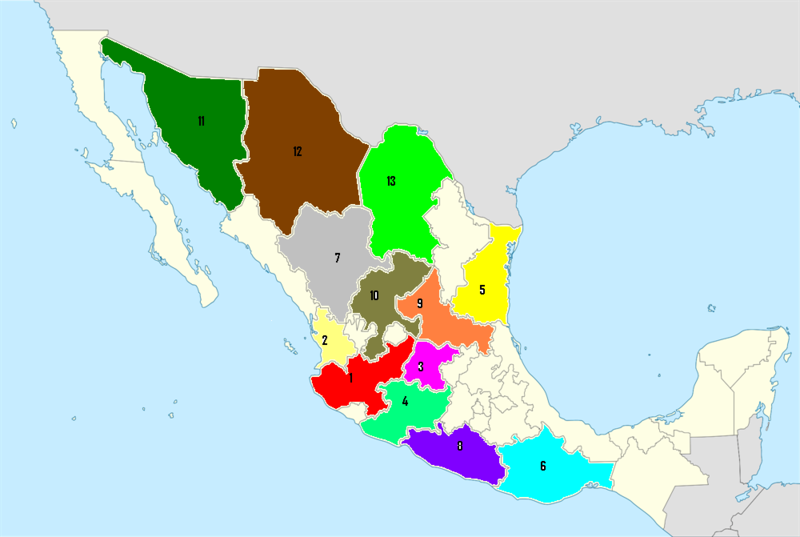 -Mezcal can only be made in 8 states; Oaxaca, Durango, Guerrero, San Luis Potosi, Zacatecas, Guanajato, Tamaulipas, and as of 2012 Michoacan (see Sikua). -Over 30 different types of agave can be used in the production of Mezcal. The most common agaves being Angustifolia (Espadin), Potatrum (Tobala), Karwinskii (Barril), Maxicana, Americana, Tequilaña Weber, Cupreata, Inaequidens, Maximiliana, Salmiana, and Angustifolia, just to name a few. Around 70% of all mezcals are produced in the state of Oaxaca. -Siku is what the native Indians used to call the maguey. The Union of Mezcaleros of Michoacan sought inclusion in the Denomination of Origin for Mezcal for over 2 ½ years, but were denied so they decided to get their own Denomination of Origin, and call it Sikua. After many years, and due to pending NOM 186, Michoacan was finally accepted as part of the Mezcal producing region in 2012. -only the Agave Angustifolia var. Pacifica is used in the production of bacanora. -Raicilla is crafted in the mountains above Puerto Vallarta, Jalisco and is not controlled by a Denomination of Origin. The Angustifolia, Rhodacantha, Maximiliana, and Inaquiden agave are used in the production of Raicilla, not the root of the agave as many have thought. The "mezcal producers in the state of Jalisco called their product raicilla (which means root), to get around the "legalities" of mezcal and tequila. -Destilado de Agave can be produced anywhere with any type of agave, and does not have a Denomination of Origin. Although, there are some people who are doing their best to outlaw the production of 100% destilado de agave products - this also includes Raicllia. If this law (NOM 186) passes, it will destroy a lot of families who depend on the money made from making these distillates, and part of Mexico's history and culture will be eliminated. -Pulque is the fermented nectar (aguamiel) that is collected from the living agave. It has an alcohol content of about 3%, and is THE traditional alcoholic beverage of Mexico dating back to the Pre-Hispanic period! While it is usually served fresh, there are a few manufactured brands. Agave spirits have also been made (commercially) in the United States, South Africa and now India. I'm sure there are small family producers in Central America, that make product for their family and friends, as well. Also, don't be surprised to see China produce an agave spirit in the near future too. If there is anything that I have left out, or incorrectly stated, please let me know - Gracias!